Our ever-changing selection is comprised of the most trusted brands in the industry. Browse below or speak to us about order-in custom flooring. 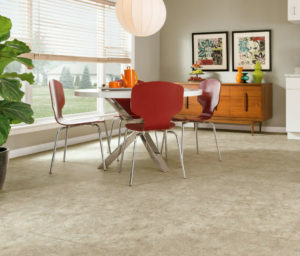 Still can’t decide on the right flooring type for your home? We’ve made it easier by weighing the pros and cons for you. A hard, solid base and protective glaze make ceramic and porcelain tiles resistant to water, humidity, and most scratches and stains.This durability lasts over time and can increase your home’s resale value. Ceramic and porcelain hard surfaces are often cold and uncomfortable, and the grout lines between tiles can be difficult to clean.Their dense, heavy nature also requires a lot of tools, mortar, time and a strong subfloor for proper installation. 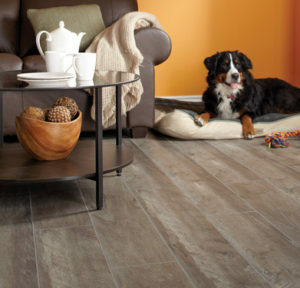 Because of its protective overlay, laminate flooring provides a scratch-resistant surface and natural hardwood esthetic. Also, most planks snap together using a tongue-and-groove system, which equals a quick and pain-free installation process. Since laminate flooring has a wood base, it’s still prone to moisture damage. It also emits a loud, hollow noise when walked on, and due to its thin underlayer can be extremely cold depending on the weather. Hardwood is a popular choice simply because of the warm, natural feeling it evokes, which increases your home’s resale value.It’s also very easy to touch-up and refinish as needed. Hardwood is unable to withstand significant amounts of moisture, and can become warped or stained from spills, leaks or tracked-in rain water. Furniture, appliances and your pet’s nails can also leave deep scratches and dents that are clearly visible on its glossy surface. 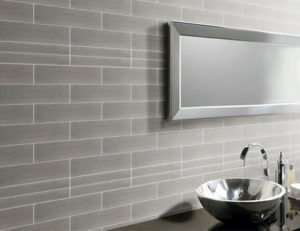 Like vinyl planks, vinyl sheets are 100% waterproof and have a seamless installation process. Additionally, it’s cushion backing makes for a warm, comfortable surface. Vinyl sheeting is usually installed over another subfloor, which needs to be prepared and cleaned thoroughly beforehand. Significant repairs, such as large tears and gouges, can also require entire sections to be replaced. Vinyl planks and tiles maintain a natural wood look while adding incredible durability through commercial grade wear layers and fiberglass reinforcements. They’re also 100% waterproof, which is ideal for kitchens, basements, bathrooms or any other space with a high amount of moisture. When it comes to installation, vinyl planks are easy to cut and snap together quickly and efficiently. Frequent heat exposure, such as through radiators or vents, can lead to discolouration. And despite its durability, vinyl is still prone to dullness or scratches that are glaringly apparent on its shiny surface. 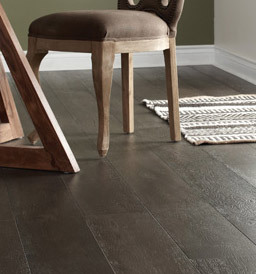 We have a large selection of Hardwood, Laminate, Vinyl, Ceramic, Porcelain and Carpet in stock at discount pricing. If you can’t find what you’re looking for at the warehouse visit our sister store PRODUCTS Fabulous Flooring for custom orders.